Nutrition advocacy group lists 10 items that have been responsible for thousands of illnesses. Leafy greens were rated the riskiest food by the Center for Science in the Public Interest. NEW YORK (CNNMoney.com) -- Leafy greens -- including lettuce and spinach -- top the list of the 10 riskiest foods, according to a study from a nutrition advocacy group released Tuesday. The scientists rated these foods, all of them regulated by the Food and Drug Administration, by the number of outbreaks associated with them since 1990, and also provided the number of recorded illnesses. The severity of the illnesses ranged from minor stomach aches to death, the center said. With leafy greens such as lettuce, the top cause of illness were pathogens like E. coli, Norovirus and Salmonella in foods that were not properly washed. 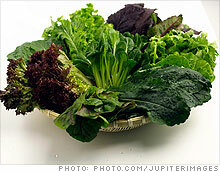 Over the past 20 years, leafy greens caused 363 outbreaks, resulting in 13,568 reported illnesses, the center said. That's compared to berries, No. 10 on the list, which were associated with 25 outbreaks totaling 3,397 reported illnesses. "Leafy greens are a healthy home run, but unfortunately they're associated with food-borne illness," said Sarah Klein, a staff lawyer with the center who helped prepared the study. In all, the Top 10 resulted in more than 1,500 outbreaks, totaling nearly 50,000 reported illnesses, according to the center, which added that most food-related illnesses don't get treated or reported, so the real total is likely much larger. "Millions of consumers are being made ill, hundreds of thousands hospitalized and thousands are dying each year from preventable foodborne illnesses," the study said. "Unfortunately, the FDA is saddled with outdated laws, and lacks the authority, tools and resources to fight unsafe food." Food producers, including the Western Growers Association, released statements criticizing the report. "Farmers are consumers, too," the association said, in a release from spokesman Paul Simonds. "They eat the fresh produce they grow as do the members of their families, and have invested millions of dollars enhancing food safety practices in the last few years. Scaring people away from eating some of the healthiest foods on the planet, like fresh produce, does not serve consumers." Salmonella was also a chief culprit in egg, cheese and tomato-related illnesses, the study said, in cases when eggs are undercooked and when cheese is not processed properly. Salmonella can be difficult to remove from raw tomatoes without cooking, according to the study. The study also associated Salmonella and E. coli with potatoes. Klein said this generally happens when cold-prepared potato items, such as potato salad, are mixed with other contaminated ingredients. Unrefrigerated fresh tuna deteriorates quickly, the study said, releasing harmful toxins, and canned tuna gets dragged into the picture because of mixed-in ingredients such as mayonnaise. Improperly washed oysters are at risk of Norovirus. Rich Ruais, executive director of the Blue Water Fisherman Association and the American Blue Fin Tuna Association in Salem, N.H., disagreed with the study's "bad rap" on tuna. "Tuna? I beg to differ," he said. "Tuna is one of the healthiest foods on the Earth. It's life sustaining; it's life prolonging." Ruais said the tuna-based diet of Japanese citizens plays a big part in their high average longevity. He also said the FDA strictly mandates that tuna is gutted and stuffed with ice immediately after it's caught by commercial fisherman, and submerged in slush once it gets to shore, to prevent risk of pathogens. More surprisingly, bacteria can also survive in ice cream, primarily from the Salmonella contamination of eggs, an important ingredient that is sometimes undercooked, the study said. Much of the study's blame goes to a 1994 outbreak that sickened thousands of ice cream lovers in 41 states. The National Milk Producers Federation released a statement criticizing the report as "based on outdated information." "Cheese and ice cream products are among the safest, most stringently regulated foods in this country," said the federation, in its release. "The cheese examples in this report mostly concern consumption of raw milk products, which neither [the] FDA nor the dairy industry recommends. The ice cream example is 15 years old and was an isolated incident."